I have three pet peeves that make me cringe each time they are executed by food writers - the first being the mortal sin of using the possessive apostrophe for plurality; the second is lauding the authenticity of a dish that isn't even close (e.g., gushing over how the pork belly in merlot reduction with Serbian pule cheese poutine at Hot Chef Restaurant is just like Canadiens eat in Montréal); and the third is describing something other than chicken as "tasting like chicken". In regards to the third peeve, I am willing to look the other way when it comes to the yard bird’s very distant cousin, the iguana. While other reptiles such as alligators and turtles have more complex flavors, the iguana's mild taste is more reminiscent of chicken than any other animal. The thought of seeing a whole iguana basting on a spit rotisserie or having its clawed arms being slid off skewers at your favorite churrascaria would send most people over the edge, but in more manageable butchered and trimmed pieces it could barely be distinguished from chicken with the exception of the color and texture. Although it is a formidable-looking creature, the iguana is not generally aggressive, which makes it a popular choice as a pet. Its sharp teeth are designed for tearing leaves (the iguana is strictly an herbivore, unable to process animal protein); its jaws are capable of delivering a painful bite, but the iguana rarely does so unless threatened. It is more likely to use its tail (which is often longer than its body) as a whip, and may also defend itself with two pairs of sharp claws, but in most cases flight wins out over fight - they are superb swimmers and excellent climbers (spending a great deal of their time tree-borne), but are built sturdy enough to endure drops from a tree that would kill a person. The most popular species of the reptile is the green iguana, which originated in the equatorial region of South America, migrating north into the Caribbean and Central America. The name "green iguana" is often a misnomer, with representative animals displaying a wide variety of colors including green, blue, red, orange and black depending on their geographic location. Over the past few decades, the green iguana has become a major problem as an invasive species in the northern islands of the Caribbean, the Rio Grande Valley in Texas and southern Florida. Most of these illegal aliens were pets or zoo specimens that were either released into the wilds of suburban Florida when they grew too large and unmanageable (a mature green iguana can reach a length of about 5 feet from nose to tail) or were clever enough to devise their own escape from captivity; other immigrants arrived as stowaways on ships carrying produce throughout the Caribbean. Like the nutria (another South American illegal) in Louisiana, the green iguana is now regarded as a pest since it is a lean, green, eating machine, prompting local governments in Puerto Rico and Florida to implement programs that allow the reptile to be captured or hunted for food. 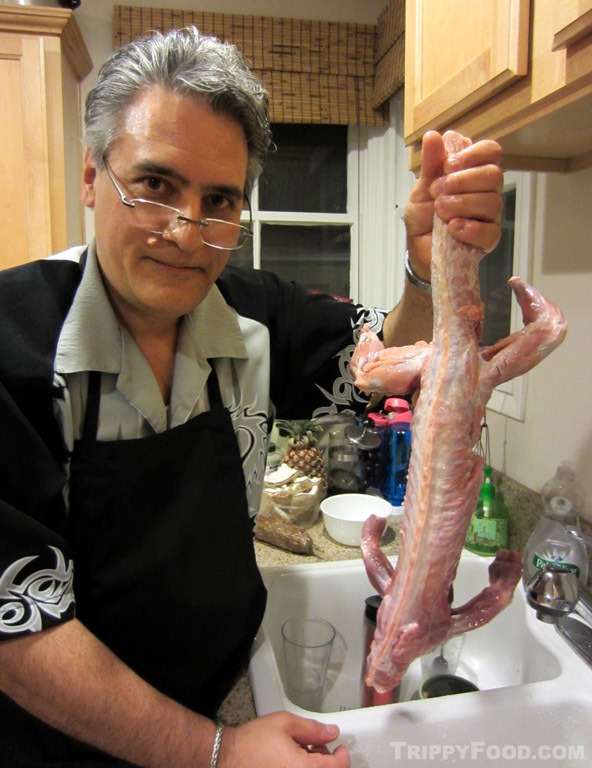 I recently acquired a skinned, gutted and frozen iguana from ExoticMeatMarket.net that was sourced from Puerto Rico; the carcass was intact save for its head, feet and a long section of tail and curled up in a plastic bag with approximately the same circumference as a basketball. I had underestimated the unfurled size of the animal and had to rethink my original intention of roasting it whole. 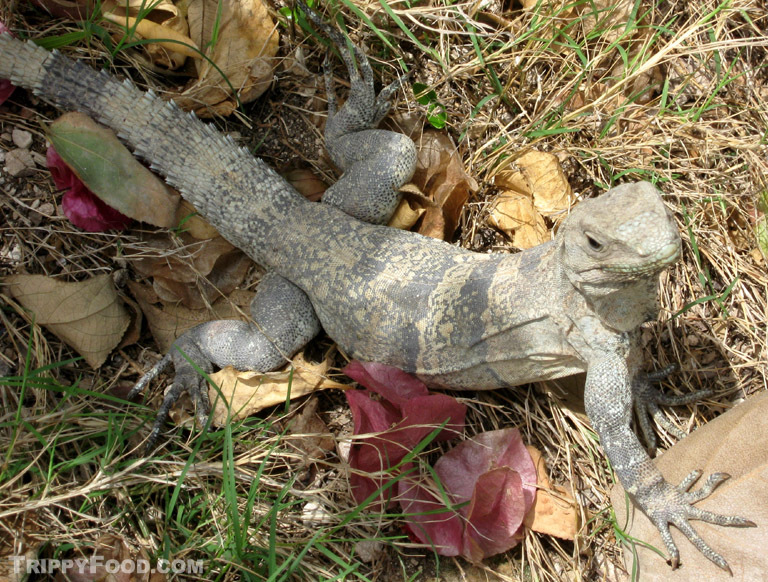 Caribbean cultures where the iguana is regularly consumed as "bamboo chicken" or "tree chicken" generally cut the lizard into pieces for cooking; in parts of Mexico, it is often barbecued or grilled whole. 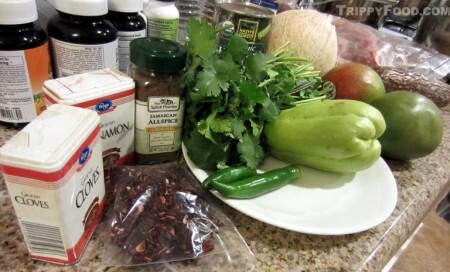 I opted for the former option and chose to make a Caribbean-influenced stew, bringing the reptile and all the necessary ingredients to friend, foodie and multimedia food personality Eddie Lin's house where he regularly allows me to desecrate his well-equipped kitchen. Since the iguana has a mild flavor, I chose ingredients that would suggest the taste of the islands or be available in the iguana's habitable range - a coconut (which I planned to milk for the broth); mangoes, hearts of palm, and chayote squash (to be diced and added for texture and flavor); Serrano chiles for kick; allspice, cinnamon, and cloves to approximate a mild jerk seasoning; and dried hibiscus flowers (a favorite of the iguana itself) added for zest. 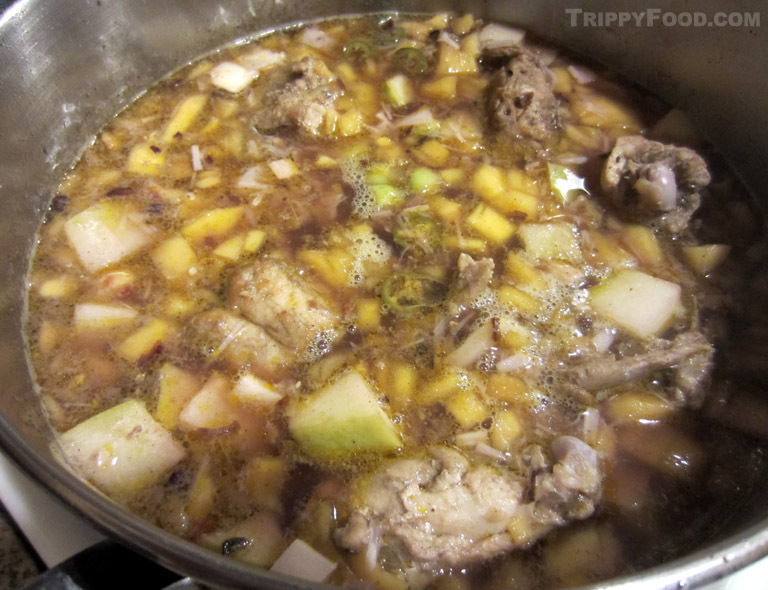 I butchered the iguana into chicken dinner-sized pieces and browned them in a pot, adding the rest of the ingredients and slow cooking it on a lower heat after bringing the pot to a boil. I had retained the forelimbs and cut them apart at the joints for a simple fry in the wok to try to get an approximation of the basic taste of the meat. Eddie accepted the honor of frying the iguana in the style of what he called "iguana wings", adding only a little salt, pepper and garlic. 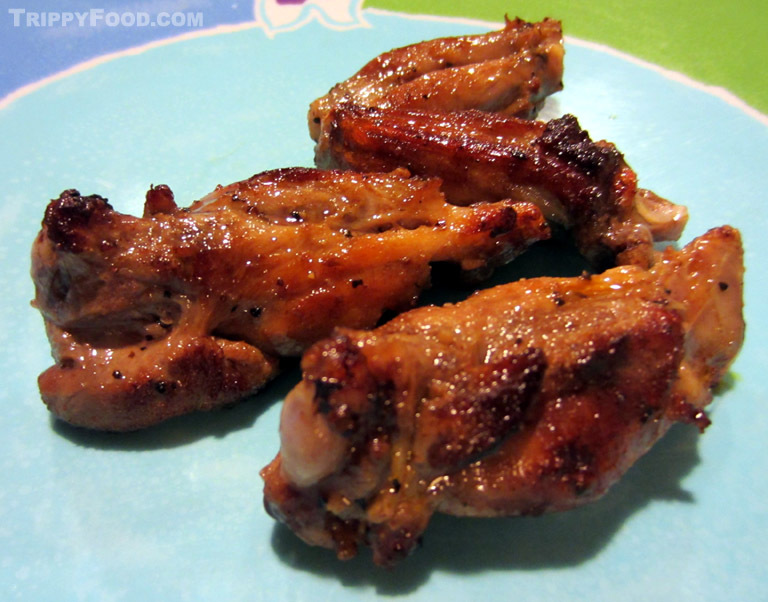 While being almost identical in appearance to chicken wings, the texture was more like that of a turkey leg and the meat was darker; since iguana is high in protein and ultra-lean I was expecting it to be dry, but the flesh was moist and juicy. The taste was virtually indistinguishable from chicken, which prompts the question, "Then why even eat it? "; the answer, of course, is that if Frank Perdue or John Tyson had decided to factory farm iguana instead of chicken we wouldn't even be having this discussion. Since this was an experiment of grand proportions, I was somewhat apprehensive as to how the stew would turn out. As a side dish, I cut a yucca root into fries which I made in the wok; throughout the Caribbean, yucca root appears in dishes with similar usage to potatoes, although it has a firmer, starchier consistency and so I thought it would be a good accoutrement. 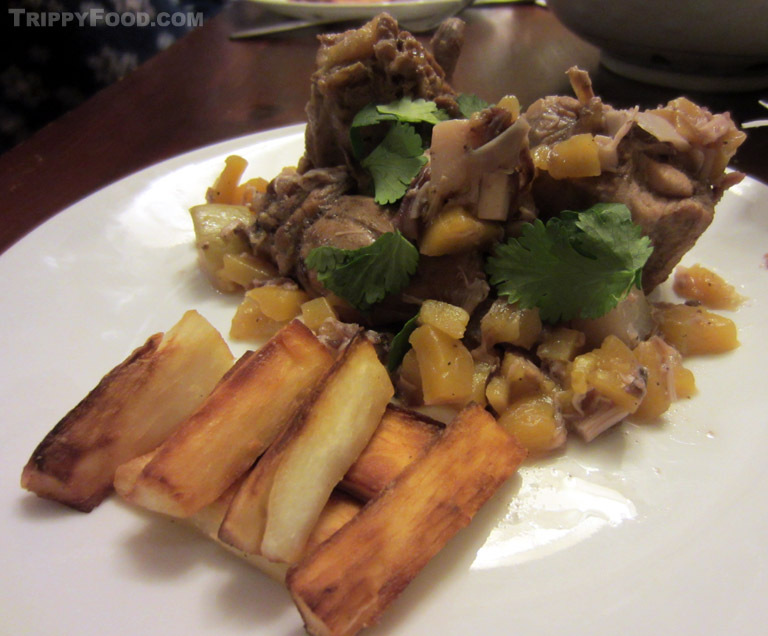 Eddie artistically plated the stew adding a garnish of fresh cilantro and Jenga-stacking the yuca frites in front; the moment of truth had arrived. The flavors of the ingredients permeated the meat and the smell from the mango, coconut and spices was intoxicating. The Serrano chile added a mild burn that finished each bite and the pear-like chayote remained firm-fleshed, providing texture and borrowing taste. I was not as doubtful about the finished product with the iguana as I was with our recently-prepared nutria, in part because aside from a dubious claim of funkiness by Anthony Bourdain, there are very few stories regarding iguana meat imparting an undesirable flavor. I would easily eat iguana again at any available opportunity; perhaps the next time I wanna be in Tijuana eating barbecued iguana I'll simply order another lizard online. This entry was posted in South and Central America and tagged allspice, bamboo chicken, Caribbean, Central America, chayote, chicken, chiles, coconut, Deep End Dining, Eddie Lin, ExoticMeatMarket.com, Florida, hearts of palm, hibiscus, Iguana, jerk, mango, reptile, seasoning, Serrano, South American, tastes like chicken, tree chicken, yuca frites, yucca. Bookmark the permalink.